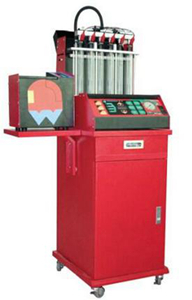 Gasoline injector cleaning and testing bench used for checking and cleaning the auto fuel injector and is preferred for auto’s maintenance, researching, evens the departments of auto’s teaching and training. ♦Test the operating state of gasoline injectors when it is working at the normal speed, idle speed, medium speed, high speed and varible speed. ♦The injection uniformity of idle speed, intermediate speed and high speed; evenness and injection angle, and state of amortized gasoline when the injector is working at the idle, medium and high speed. ♦Equip universal test bench circuit controller and the gasoline injector connectors selected for special automobile models make it suitable for the cleaning and detection of gasoline injectors for all the automobiles inside and outside China.